Here's a wonderful curio that Second Run DVD released back in 2005 and that has only now fallen into my lap. As fantastic a piece of cinéma vérité that you could wish for, this film by avant-garde artist and performer Shirley Clarke deserves to be seen as just as influential a work as the films of "D. A. "Pennebaker, the Maysles and Warhol. It transcends a number of forms and genres and is a documentary, a pre-Stonewall gay confessional, an art film and a record of an extraordinary 'performance'. For over 90 minutes Jason Holliday, who we learn is simply the pseudonym for Aaron Payne, holds court. The camera, as in Warhol's singular cinematic portraits, is fixed on this one man as he slowly unravels under the influence of drink and drugs. It is brutal and voyeuristic and with the goading of Clarke and Jason's friends Carl and Richard from behind the camera it pre-empts much of reality television's territory of ritual humiliation and redemption. It mirrors current media obsession with the 'real' that emerges from what Laurie Ouelette and Susan Murray define as reality television in "nonscripted access to 'real' people in ordinary and extraordinary situations" and where "the access to the 'real' is presented in the name of dramatic uncertainty, voyeurism and popular pleasure." 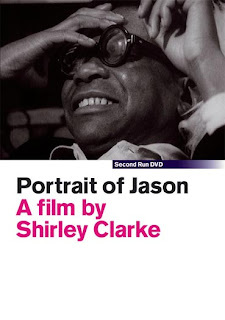 Clarke's film is not just about the 'real' of reality television but it is also concerned with the construction of the real, the realness of Jason's identity, particularly the 'realness' that he himself offers as a mark of his 'genuine' gay self. With gay identity at the centre of the film, Clarke also pre-figures what gay men themselves will determine as their 'realness' within a heteronormative culture that takes us from the drag queens facing up to riot police in Greenwich Village in 1969 right through to the 'realness' of young black gay teenagers in Jenny Livingston's Paris is Burning, a 1990 documentary that introduced us to another form of gender performance in 'vogueing'. 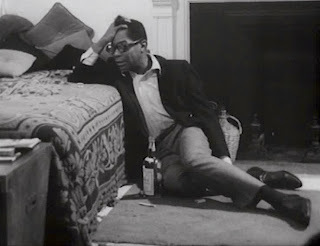 In Jason Holliday's ritualisation of being black and gay in late 1960s America we see an embryonic equivalent of Livingston's film where 'realness' becomes an effect of postmodernism and what Tim Dean sees as the "the imitative and fictive structure of identity." As the film progresses, Jason weaves a self-narrative and slowly uncovers a multiple of identities - gay hustler, house-boy, aspiring cabaret star, and his upbringing with a violent, homophobic father 'Brother Tough'. Whether you find much of it funny depends on your sense of humour and, while it may be reductive to say that the majority of gay viewers will recognise much of themselves in Jason, the film should be celebrated for its revelatory nature about a black gay life in pre-Liberation America, providing a schizophrenic picture of wantoness, truth and self-delusion such that only the books of John Rechy, especially City of Night and Numbers or Mart Crowley's Boys in the Band would later touch upon in the period. Certainly those of us who understand how gay men use self-deprecation, bitchiness and bathos, as a survival mechanism that helps us to assess and set appropriate expectations as well as amuse in social situations, will find a form of kinship here. This is evident in the frank and knowing way Jason explains the palette of sexual activity he indulges in as a gay whore, in the preview of his cabaret act which comes complete with drag props such as hats and feather boa to regale us with a Mae West impression, and in the often hilarious anecdotes about his work as a house boy for rich, white clients in San Francisco. 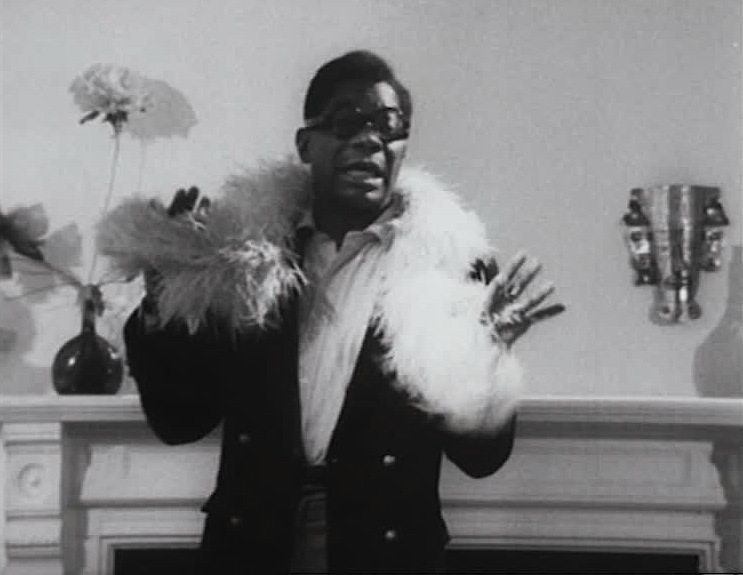 One of the most unsettling and extraordinary moments is when he imitates Butterfly McQueen's Prissy from Gone With the Wind and spectacularly conflates racial stereotyping and the performative codes of drag while also offering these gay and racial stereotypes as part of his own solipsist identity. When he does explore his childhood roots and the pain endured from an ignorant father's beatings then the film certainly becomes less about recording a nightclub turn and more about exhuming the social forces that shape gay men's characters and nature. It also becomes the focal point from which you can extrapolate Jason's mode of existence and his drift into a world of rent boys and skivvying for white, rich sociopaths. How much of this is 'real' or 'performance' is never clear because as much as Clarke's camera plunges in an out of focus or the screen goes black (signifiers, along with the off camera questions, of the constructed nature of this performance and the film itself), Jason slips and slides across a number of identities and you do wonder how much of this is merely an opportunity to finally perform his nightclub act while revealing some very private and personal truisms learned from a particularly harsh life on the streets. When he bursts into song (singing 'The Music That Makes Me Dance' from Funny Girl as he expounds on his attempt to carve out a nightclub act) he reveals as much about his own desires for the right man to come along, his own desires to make it, as he does about his taste in musicals. Jason, in summing up the harsh reality of his life, offers “It only hurts when you think of it. And if you’re real you’ll think of it a long, long time” and clearly Clarke did offer him a long time to mull it over. This 90 odd minutes is culled from a 12 hour period of filming "a stoned whore" as Jason candidly refers to himself. The final third of the film is raw and emotional. By this point, Jason has literally worn himself down, and many viewers will probably feel he has done the same to them, and the drugs and drink have taken their toll. The 'performance' boils away to reveal the rather damaged, lonely individual beneath with a certain amount of unpleasant barracking from his friends behind the camera, with one describing him as "a rotten queen", reducing him to tears of frustration and identity confusion. It is at this point that the film is revealed as a provocation on behalf its makers who clearly wanted to get beneath the skin of someone they knew and regarded with a mixture of love and loathing. Amazingly, Jason remains strong throughout and does not fall into a trap of self-pity because, as Tom Sutpen rightly states in his review of the film, "Jason is far too intelligent and too keenly awake to the absurdities in his life for his moments of excessive self-loathing to be anything more than another emotional hue on his palette, let alone the remnant of a wholly uncommon tragedy". Portrait of Jason an extraordinary film and a fascinating record of being out, gay and black in pre-Stonewall America and, while it captures one man walking through the frustrated ambitions and past misdemeanours of his life in public, it is also achieved knowing that Jason has willingly entered into a pact with a film-maker who knows what she wants from the film and who understands the subject all too well. The version on DVD here is a new digital transfer of the fully-restored film print prepared by the Film Department of the Museum of Modern Art (MoMA), New York. The quality isn't particularly stunning but then you should not expect this from a black and white, 16mm piece of cinéma vérité that's probably been gathering its fair share of dust over the years. It's raw and uncomplicated cinema. 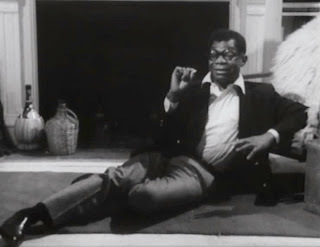 - Introduction to the film by artist Wendy Clarke, daughter of Shirley Clarke. - Wendy Clarke’s acclaimed video project Love Tapes, including Shirley Clarke’s personal Love Tape. - Booklet featuring a new Essay on the film by Tony Rayns; and an Essay by Tom Sutpen.